What's next; will we have to pay a toll to meditate? How can it be morally correct to gain a US patent on a 5,000 year old system founded in India? Who should have the right to claim Yoga? What about the "cultural heritage of the Indian people?" It is obvious to see, Yoga is definitely part of the heritage of Indian culture. Most of us believe that the theft of intellectual property is wrong, but let us combine this wrong, with theft of someone else's cultural heritage for profit. According to the Times of India, "The US Patent and Trademark office has reportedly issued 150 Yoga-related copyrights, 134 trademarks on Yoga accessories, and 2,315 Yoga trademarks." As a result, the Indian government has organized a group to gather Sanskrit and Tamil texts, which will catalog Yogic techniques and Ayurvedic medicine in multiple languages, to prevent patents of Yoga and Ayurveda. This action would make information about Yoga, and Ayurveda, more accessible to patent offices around the world. What can happen if corporations buy up every Yoga technique? It seems silly to think about, but would we be obligated to pay royalties, or negotiate rights, to perform an Asana or Pranayama sequence? One Yoga teacher, Bikram Choudhary, copyrighted a 26 Yoga posture (Asana) sequence, which he falsely claimed as his own, only adding steam to the Yoga poses cannot be called unique or IP. So, most "hot Yoga" teachers, and hot Yoga studios, around the world, perform the same sequence, without paying him a dime. How do you police an Asana sequence? Consider this: If you buy the patent to Brahmari Pranayama, how do you manage to keep track of who is performing it in every corner of the earth? The idea is ludicrous, and the patent is not really enforceable. Yoga is a complex subject and some people are still trying to grasp what Yoga is. Some people think Yoga is exercise. I suppose you could patent an exercise, but it has never been a successful business strategy to patent an exercise. Every time you trademark an exercise, another person will label it as something similar, but not the same. You cannot stop everyone in the world from doing push-ups because you bought the trademark and patent. However, Yoga is not an exercise. Yoga is the unity of mental, physical, spiritual, and emotional health, for the improvement of all mankind. Yoga is a philosophy, a science, a health maintenance system, and the "Mother of all self-improvement systems." Yoga is just too vast a subject to try to own it. The purchasing of Yoga patents is a lesson in futility. Should we buy patents for mantras, breathing, good posture, and eating right? Those are also valuable components of Yoga, but one component of Yoga is not all of Yoga. Yoga is composed of many parts. Maharishi Patanjali wrote that Yoga is composed of eight limbs in his Yoga Sutras. According to Swami Ramdev, "Yoga can't be owned and run like a company. Since there are attempts to patent this tradition (of Yoga) in America, the Centre and Yoga organizations should take measures to prevent it." He is not the only Guru who is disturbed by the patenting of Yoga. This is disturbing to most Yoga practitioners and Yoga teachers. So, what can the rest of us do about it? We can take action by writing, Emailing, and faxing our law makers. 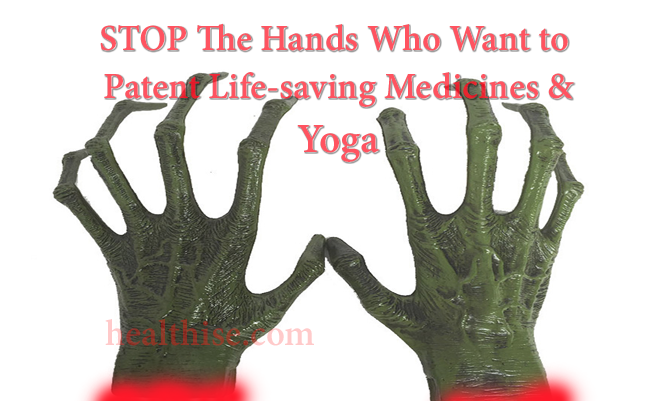 Stop the foolishness - Say, "No," to Yoga patents.